Fishing in Ucluelet can be great! Although, the westcoast of Vancouver Island can have some dramatic weather. Limits of halibut have been very common. 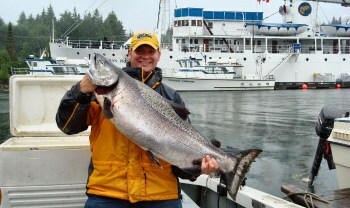 Salmon fishing has been steady with some good catches of Chinnooks and Coho to be found. We are now taking bookings for July August and September for Ucluelet please book early for these months. Limits of Chinooks, Coho and Halibut are normal for these three months. Ucluelet is a fisherman’s paradise, a jewel on the west coast of Vancouver Island.